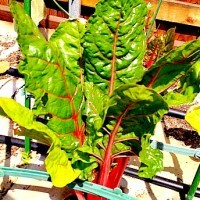 Swiss chard or Rainbow chard (Swiss chard with color) is one of our family’s favorite vegetables. It’s so easy to grow, requires little maintenance and can thrive in a pot or in the ground. Its beautiful colors add charm and visual appeal to your garden which no eyes can resist. When we cook it for guests it’s always a big hit! Nothing beats fresh Swiss chard from the farmers’ market or enjoyed from your own garden. Purchase starter Swiss chard at a nursery and plant in the spring or in warmer climates like southern California, I’ve grown it through fall and winter with other leafy greens. In March and April, you may find it sold at the Farmers’ markets as starter kits. You can also start seedlings indoors a few weeks before the last frost is anticipated. In the spring and fall it typically doesn’t require daily watering. In the heat, be sure to water daily. Chives can help prevent aphids (plant lice). We grow regular chives and garlic chives near our Swiss chard. Some gardeners recommend planting onions near Swiss chard. When gardening, check for caterpillars or bugs and remove them from leaves by hands. When leaves are fully grown, cut stems at the base of the plant so that new leaves can grow back quickly. Weather permitting, you may be eating from the same plant from spring to late fall.